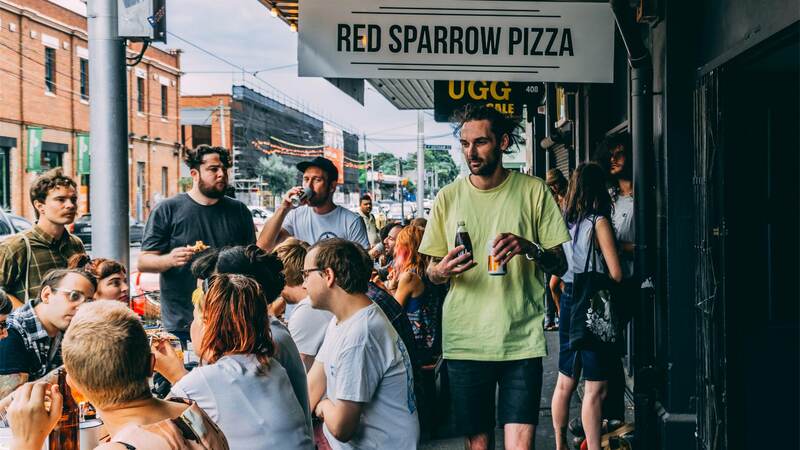 Bigger isn't always better, but in the case of Collingwood's all-vegan pizzeria Red Sparrow and its recent expansion, we're betting there won't be too many complaints at all. In a move that's sure to slash queue times, the Smith Street haunt has busted through a wall and taken over the space next door, now boasting an extra 40 seats on top of its original 38. The new dining space, unveiled over the weekend, rocks a similar fit-out to the first, decked out with a warm mix of recycled timber, exposed brick and moody lighting. Two hefty communal tables are primed for those group pizza feasts and there's a couple of street-side options for those who prefer to people-watch. The pizza offering is built around that same commitment to top-notch plant-based ingredients that has set Red Sparrow apart since it opened back in 2016. Here, tuck into crafty, vegan riffs on the classics, including the Patatas Bravas, with potato, dairy-free parmesan, chipotle aioli and a mock chorizo, and the Mushroom, topped with king browns, caramelised onion, truffle oil and thyme. If you're looking for a pizza that'll make you feel as healthy as your morning superfood smoothie, look to the Supergreen, loaded with kale pesto, zucchini, broccolini and microherbs. Prefer yours loaded with chilli? Choose the fiery Volcano, featuring house-pickled jalapeños, habanero, Sriracha and chilli flakes. To cool your no-doubt burning mouth, finish with the dessert pizza, decked out with Nutella, banana and vegan vanilla ice-cream.